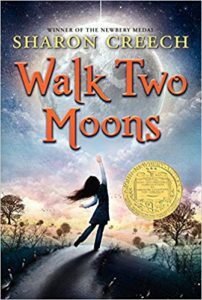 Walk Two Moons, the Newbery winner by Sharon Creech, has long held a place in my heart. It brings me back to my first teaching job as a 5th grade teacher in the Bronx; in a vibrant neighborhood tucked in between Fordam Road and Arthur Avenue. It brings me back to Michelle, Birttany, Sabrina, Omari, Alijah, Michael and the many other cherubs who I had the honor of teaching. It brings me back to facilitating my first book clubs after having the good fortune to attend a workshop at Teachers’ College Columbia. The story is one of resilience, strength and love. It is at times funny and always heartfelt. 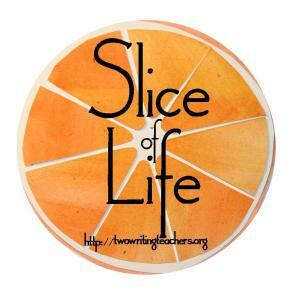 I fell in love with it and began devouring other books by Sharon Creech, an author who I discovered thanks to a beloved mentor. Lucia couldn’t put it down. I asked if I could read it with her and she enthusiastically agreed. See, I have to admit that as she grows as a reader and will happily spend hours reading on her own, I read with her less and less. I catch myself devoting more time to read with my younger daughter, Elina who is just moving into early chapter books. Lucia and I will talk about the books she is reading but found myself wondering: “When was the last time I sat and read a novel with her?” So I caught up to where she was in the book and we started reading together. I realized that yes, Walk Two Moons really is as wonderful as I remember. As I read aloud to Lucia, we stopped to talk about the characters and setting, looking up maps of the US so that we can trace Sal and her grandparents’ journey. We laughed at the funny parts and cried at the ending. We reread passages of powerful language and let it sit in us for a moment before reading on. I realized that while Creech’s writing is masterful, it is reading this book with people I love, first my 5th grade students and now my daughter, that make it one that I carry in my heart. ← How Did You Increase Your Professional Learning This Week? So wonderful to share books that you love with people you love. You capture the moments so beautifully! Lovely post! Hopefully Walk Two Moons will be one that your daughter will also carry in her heart. And if not, I feel confident that she will find her own. You’ve shown her the way.